We offer a concentrated concentrated fabric rinse-aid for your laundry, specially designed to breathe new life into your textiles by making them soft and supple for easy ironing and comfort, while delicately scented and disinfected. Note that it removes static electricity from the laundry and retains its hydrophilicity. This cleverly formulated product is safe for your clothes and does not stain. A small dose is enough for a large quantity of laundry. This product is available in 1 liter bottle. 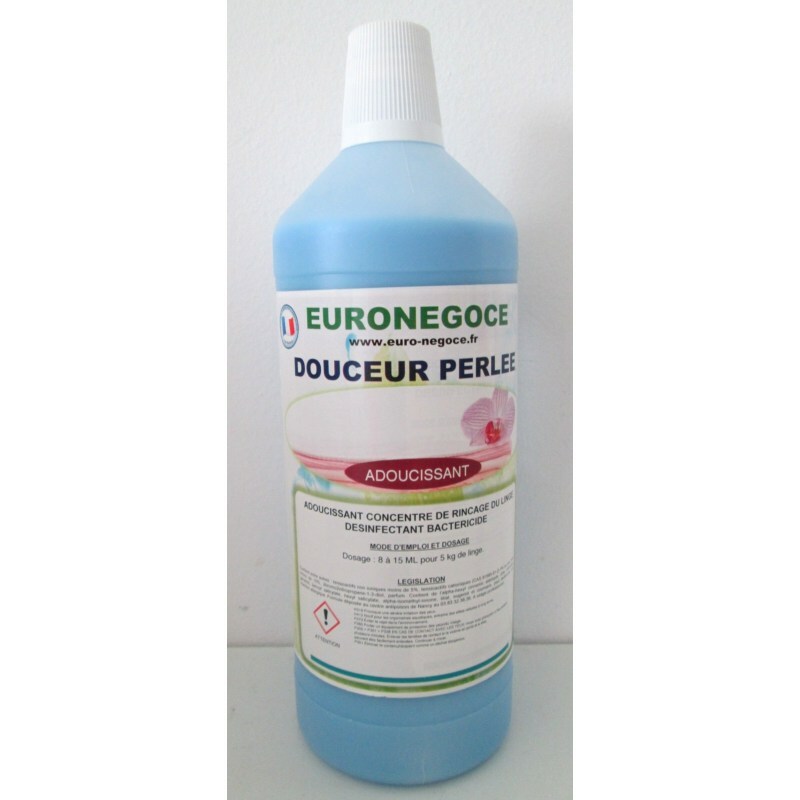 The Euronégoce Douceur Perlée concentrated rinse softener is packaged in a 1-liter bottle that gives you plenty of washes, especially since the power of its formula reduces its dosage. Its pH is 4.4 and its formula is specially designed for an efficient and complete treatment of your textiles, which will be softer and more flexible than ever before. The elimination of the static electricity that it offers will greatly increase your comfort, especially for your wooly linen. Finally your ironing will be simplified, and the fibers of your textiles will be disinfected in depth and suffused with a soothing smell. This product leaves no stains on the surface of your clothes and can be used without fear. This product is a viscous liquid composed of quaternary ammonium, nonionic surfactant and preservative. More than 90% biodegradable, it is environmentally friendly and complies with environmental standards. The ultra-mild concentrated rinse-softener product may cause severe eye irritation and is harmful to aquatic organisms, so handle the liquid thoroughly and avoid release to the environment. We propose an average dosage of 8 to 15 mL for a total of 5 kg of linen. This product will ideally be kept in a closed can and in a temperate environment, out of reach of children. 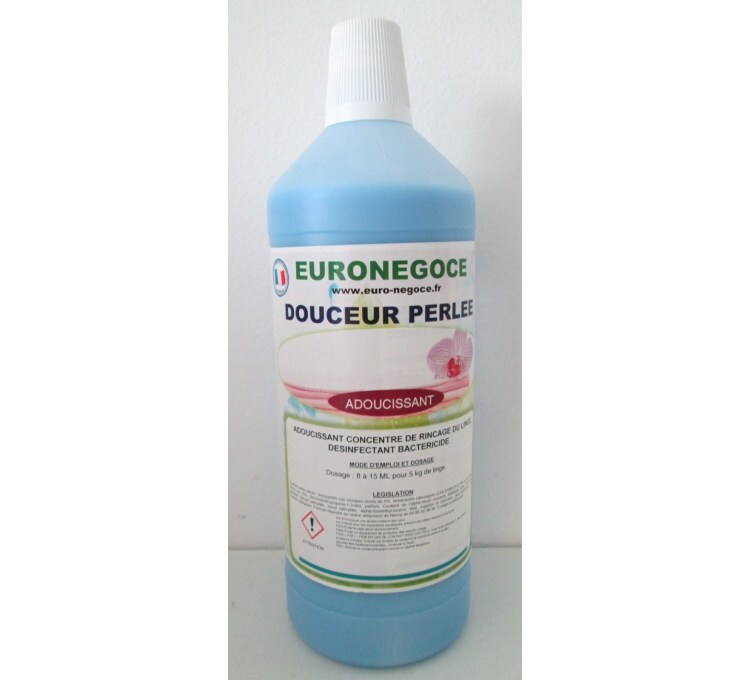 Euronégoce products are manufactured in full compliance with safety and environmental standards in accordance with the decree and the decree concerning cleaning products for equipment in contact with foodstuffs. In addition their formulas are deposited in close poison center. You choose a product combining quality and reliability.